Back when I started blogging about baby food, one of the comments I heard a bit was 'why are you doing the fruit based foods, everyone's going to like them anyway. Do more savoury foods!' 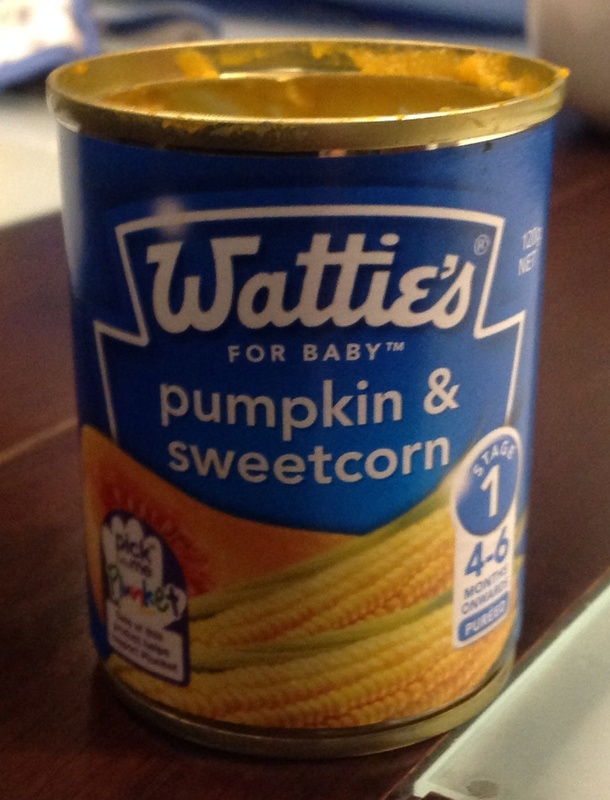 So today I decided to branch out into the adventurous world of puréed pumpkin and sweetcorn. What an adventure! Initial thoughts: Had Warhol decided to paint cans of Watties baby food instead of Campbell's soup, this could've been his Mona Lisa. After plain apple and plain pear, this would be the most ubiquitous of the stage one range, a classic kiwi staple that I imagine would rival only baked beans as one of Watties' top grossing products. On opening the can, a gelatinous ochre mass greets the eye, not dissimilar to a slightly discoloured lemon curd, if you will. Emily's reaction: I missed Emily's feeding time due to working late. However, I am reliable informed that once she was distracted from the rampaging toddler brother, it went down a treat. A small coating at the bottom of the can is all that is left for my testing. Bouquet: Not surprisingly given the ingredients, pumpkin features predominantly on the nose. A strong, sweet scent, most likely raw, or lightly cooked and mashed at best, certainly not oven roasted. The sweetcorn remains disappointingly in absentia, hoping to be discovered on tasting. Taste test: Once spooned out and spread around a plate, the gelatinous glop originally encountered disperses to reveal a slightly coarse purée, with small sinews evident within the substrate. However, the solid elements are not evident within the mouth, and the food glides down the tongue smoothly. Again, the taste is overwhelmingly pumpkin, sweet and strong, with initially dissapointingly little sweetcorn. However, after holding in the mouth for thirty seconds, the maize elements do reveal themselves, but perhaps linger on the taste buds slightly too long for my liking: the flavour remained for ten minutes after my ingestion. Unsurprisingly, the third ingredient, water, does not feature heavily at all on the palate. Overall, this took me back to the concentrated pumpkin soups of my childhood, which I would enjoy the anticipation of consuming, but then leave long enough that they would go cold. However, because my parents had paid good money for this soup, they were going to be damned if I didn't finish it. Overall: 5.5/10. I feared the savoury, however the sweetness gifted by the pumpkin makes this a palatable, if slightly in your face offering. Goes well with: A pinch of black pepper mixed in to season. To drink, water (tap), the size of the pumpkin flavours would overpower the nuances of a more delicate beverage.